Upon entering this Lyndonville restaurant you’re immediately aware that you have entered a diner! Though, from the outside it looks like a large modern building, when you first walk in that perception changes. 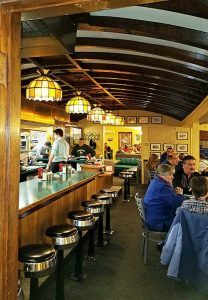 From the metal swivel bar stools to the curve of the ceiling, the first dining space looks like a traditional diner – made from and old dining car. 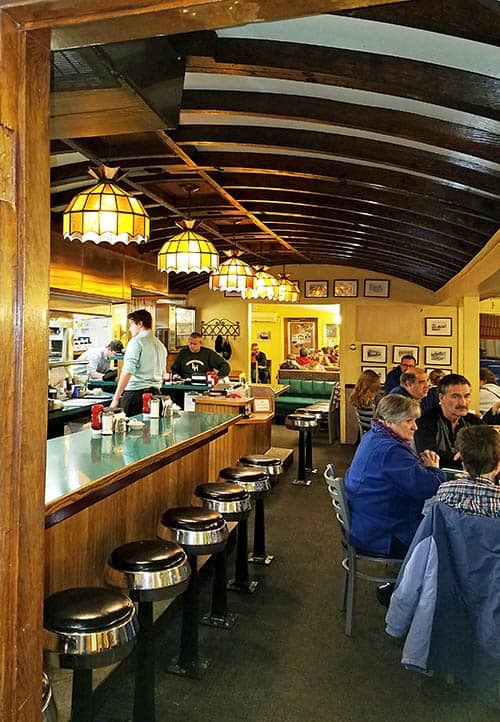 This diner has many additions, widening that initial dining space, another to house the kitchen, and a third addition adds a larger dining room off the back. Even the larger dining room keeps with the dining car feel. The square room is separated down the middle with a half wall partition. This allows for more seating and keeps the narrow, cozy feel that exists in the main dining space. Now, the Miss Lyndonville Dinner is known for their all day breakfast. And I love their sausage gravy. Delicious pancakes, eggs Benedict, and daily specials all get rave reviews (There are many reviews of this diner all over the Internet). Lunch time burgers and their meat loaf are also customer favorites. Recently, I stopped in for an early dinner with my son after a school event. I hadn’t eaten dinner at the diner before this, but wasn’t at all surprised to find the place almost full at 5:30 p.m. I have driven by enough to know that the parking lot seems to be at capacity come meal time. Luckily, there were just the two of us, and a small open table in the back. I have had their burgers and chowder a number of times over the years, and I was about to order the clam chowder (one of my favorites in the NEK) when another option caught my eye. 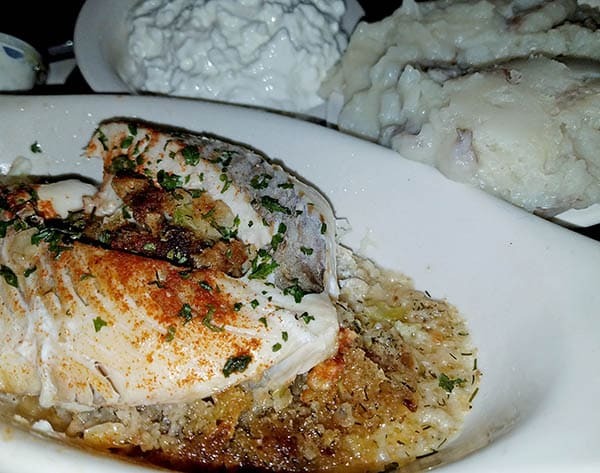 A crab stuffed broiled haddock filet. I was sold. My haddock came out well cooked. I will say that the filet could have used more seasoning. It was cooked in plenty of butter but was on the bland side. I added a little salt, pepper, and lemon and that did the trick. The stuffing on the other hand was surprisingly good. I had expected a stuffing that was mostly filler, but instead found large chunks of crab meat throughout. Now, this isn’t a seafood stuffing so it isn’t 90 percent crab with a little binder, it is more like a dressing with crab meat in it. The stuffing was seasoned, and though it could have used more garlic, I really enjoyed it. My meal came with two sides – a potato (I got them mashed) and slaw or cottage cheese. These were diner staples, with the mashed potatoes coming as a large portion. 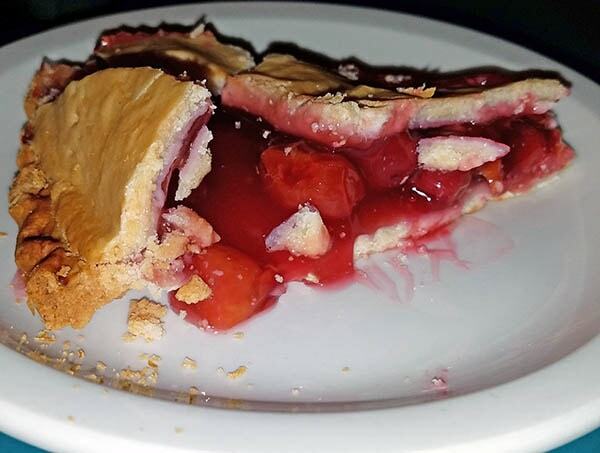 The best part of any diner is the pie selection. I tried to get a photo, but the glare from the case ruined my attempts. So I had to wait till we made our choices and they came to the table. I ordered my favorite – lemon meringue, while my son ordered cherry pie. 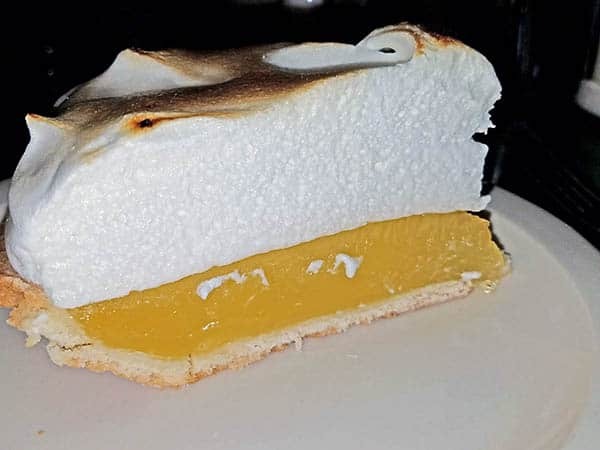 The meringue was thick on top of my pie – which I am okay with. The ethereal feel of it mixed with the tart lemon custard is a sensation I enjoy immensely. As for the cherry – I am not normally a fan but had to take a little nibble to see what it was all about. The cherries were enveloped in a thick sweet syrup that was too much for my taste buds, but found an admirer in my son, who made short work of the dish. Service at Miss Lyndonville Diner is always good. Their staff seems well trained and is always attentive. I like that they wear a quasi-uniform, black pants with a scrub top, as it is easy to tell who is an employee, and it gives a professional demeanor. The restaurant itself is clean, well maintained, and cheery – as is the staff that I have had contact with. 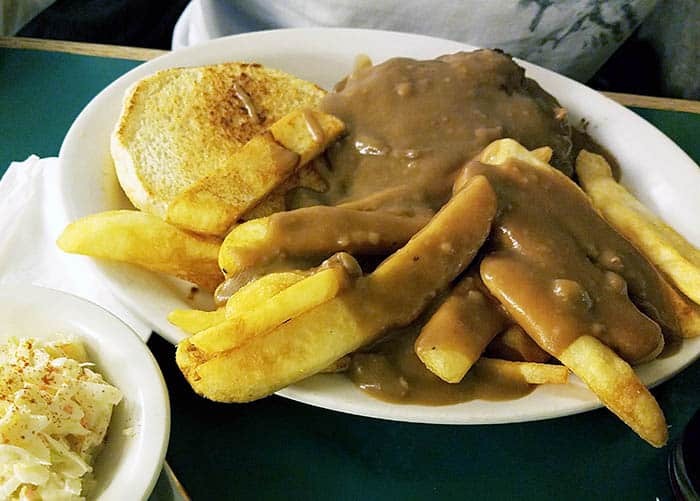 If you are in the Lyndonville area and are looking for more traditional diner fare, there are sure to be many items to choose from at the Miss Lyndonville Diner for breakfast, lunch, or dinner.